Recent estimates have put the number of recreational fishers in Australia as high as 5,000,000, with 800,000 here in Victoria. This high level of activity has a significant economic impact on coastal communities, but there is a growing realisation among fisheries managers that it is also having a major impact on the marine environment. This is contrary to the perceptions of many recreational fishers who believe that they have only a minor impact (both individually and collectively) on fish stocks and that commercial harvests are the primary cause of actual or perceived fish declines. Neither perception is supported by available studies. In a review of available research, carried out for the Victorian National Parks Association (VNPA) by Dr Mark Norman, a Victorian marine biologist, it has been revealed that recreational fishing removes large amounts of fish from our marine environment, and that recreational fishing pressure is building. A similar scale of recreational fishing occurs in bays in many other Australian states. And for a number of nearshore coastal species the recreational catch is often comparable to, or larger than, commercial catches. In a recent study of the impacts of recreational fishing in Queensland carried out by the Department of Primary Industries Southern Fisheries Centre, it was found that the recreational catches of tailor, yellowfin bream, whiting and dusky flathead were as high or even higher than commercial fisher catches. 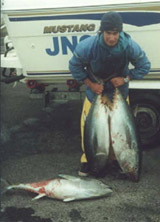 Most of the authors of the studies reviewed by Dr Norman recognised that their estimates of numbers of recreational fisher numbers, fishing hours and catches were likely to be significant underestimates as each survey failed to include all components of the recreational catch including activities such as night fishing, shore fishing, charter fishing and catch landed at sites outside survey areas. The review also found that recreational fishing pressures are growing through increased participation, more efficient gear, increasing access to areas by four-wheel drive vehicles and boats, and higher efficiency in finding fish using technologies such as echo-sounders and geographical positioning systems. Recreational fishing has a number of other actual or potential impacts that add to the pressure of coastal use. These include mortality of released animals, retention of undersized fish, lost gear, habitat damage, hydrocarbon release by outboard motors and the ecological impacts of fish removals. Increased fishing pressure is the most likely explanation for declines in several important commercial and recreational species. A consequent decrease in competition may have caused an increase in abundance of stingarees. The most conspicuous change in the 10 most abundant species was the decline of those that are often taken by commercial or recreational fishers (sand flathead, tiger flathead and, except in the shallow region, yank flathead) and an increase in species (eastern shovelnose stingaree and sparsely spotted stingaree) that are rarely caught.